The Christmas Season is here and that means the Aurora Lions Club is hard at work collecting toys, food, and donations to help make the season bright for local families in need. Partnered once again with the Salvation Army, the Lions’ Christmas Program often benefits over 200 families each year, costing the local service club $10,000 and $12,000 annually to meet demand. This year, however, many families will feel the spirit of the season thanks to a generous donation of $3,100 from the employees at Aurora’s Canadian Tire. Over the last month, employees at the Bayview Avenue store have been working hard to raise funds within the store, whether making donations out of pocket or deducted automatically from their paycheques. The amount raised by employees was subsequently matched by store management. 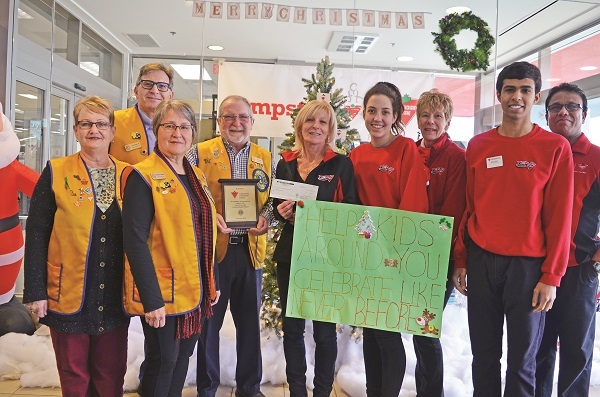 The Lions Club have spent the fall doubling down on raising awareness and securing donations and partnerships after deciding to forego their traditional Christmas gift wrapping services this year and directing their energies on the groundwork. Throughout the Christmas Basket campaign, Mr. Bondy notes the Lions will accept donations of non-perishable foods and gifts of all kinds. There are ten donation boxes set up throughout the community, including at local fire halls, all of which is collected at the Salvation Army’s depot in Aurora for organization and distribution on December 18. To arrange a donation, contact Jim Bondy at jbondy@rogers.com or call 905-591-1913. For more on this campaign or the Aurora Lions Club, visit www.aurora-lions-club-ontario.com. What will education cuts mean for kids? UPDATED. Justice McCarthy brands former Council candidate Anthony Pullano's lawsuit against Magna's Steve Hinder "frivolous", "entirely unsuccessful" and a "waste of the court's time." Mrakas, Humfryes drafting motion to put stronger deterrents in place against demolition by decay.